(Wolverine: Weapon X#14 (fb) - BTS)) - Employed by Norman Osborn's HAMMER organization, scientist Dr. David Heimerdinger mechanized the corpses of soldiers, seeking to build an army of obedient cyborgs. (Wolverine: Weapon X#12 (fb) - BTS) - Roxxon-sent Deathloks arrived from 25 years into the future. (Wolverine: Weapon X#12 (fb) - BTS) - Thereafter, Miranda Bayer fought the forces of Roxxon for 25 years. (Wolverine: Weapon X#12 (fb) - BTS) - Throughout her war, Miranda progressively lost ground and forces against Roxxon. (Wolverine: Weapon X#12 (fb) - BTS) - At some point, the General (secretly a future incarnation of Deathlok Unit L17) became leader of a group opposing Roxxon and its Deathloks/Peaceloks. (Wolverine: Weapon X#14 (fb) - BTS) <By the sociopath's own account> - An unidentified child was born (literally or figuratively; see comments) in Dunwich Sanitorium. He grew to be a violent sociopath. (Wolverine: Weapon X#14 (fb)) <17 years, 7 months, and roughly 11 days into the relative future of Reality-10511 in comparison to the main story> - The sociopath took his last life before being imprisoned. Presumably not much thereafter, he was caught and imprisoned. (Wolverine: Weapon X#14 (fb) - BTS)) - With one of their top priorities being the development of a risk management department to face the challenges of a corporation their size, such as resistant governments, stubborn populaces, and illegally powered insurgents, Roxxon began development of the Peaceloks, based on the preliminary work of the late Dr. David Heimerdinger. They used the minds and bodies of executed murderers "for that extra 'zing,'" but early efforts were "less than successful, as their cyborgs fed on and slaughtered normal people (possibly their creators). Roxxon swiftly realized they needed a stronger control mechanism for the cyborgs; they were very pleased with the results: the mind and body of a brutal murderer combined with the efficiency of a thinking computer. (Wolverine: Weapon X#14 (fb)) <20 years into the relative future> - A Roxxon agent interviewed, freed, and then shot the sociopath in the head, and then had him sent to the laboratory..
(Wolverine: Weapon X#15 (fb) - BTS) <Reality-10511> - Roxxon scientist Martin and his unidentified female co-worker installed a series of brains into cybernetic mainframes that controlled the most advanced artificial intelligence program ever designed. (Wolverine: Weapon X#15 (fb)) - The sociopath's brain was apparently the first to be activated. (Wolverine: Weapon X#14 (fb) - BTS) - The sociopath's body was rebuilt as a cyborg (Unit L17) with an artificial intelligence controlling his activities and enhancing his logic and mental capacities. (Wolverine & the X-Men#4 (fb) - BTS) - Deathlok Unit L17 was manufacted in the year 2030 (see comments). 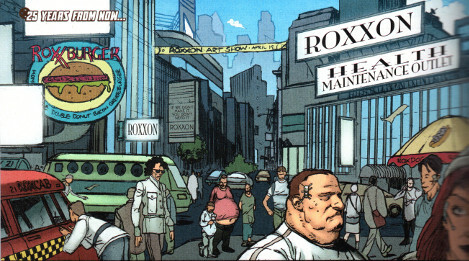 (Wolverine: Weapon X#14 (fb) - BTS)) - Roxxon apparently won out in the "Corporate Wars." (Wolverine: Weapon X#14 (fb) - BTS)) <By a Roxxon agent's account, presumably with some degree of hyperbole> - By this time, Roxxon had branches in every civilized country in the world, and they controlled every government know to man (and some unknown to man). They made money off every facet of human existence from their birthing stations to their crematoriums and everything in between. As of the most recent quarter, they were officially the most powerful corporation in history: "We have no real competitors to speak of, except maybe for God, and we've got our eye on him." They had made signifigant inroads into galactic travel. The Roxxon logo was the most recognized symbol in eight galaxies, more recognizable than the sun in some quadrants. (Wolverine: Weapon X#14 (fb)) - As Unit L17 awakened and operated under the computer's control, the speaker concluded that their hard work had paid off, and the future unequivocably belonged to Roxxon. (Wolverine: Weapon X#14 (fb)) - Unit L17 confronted and slew Matthew K. Edwards for publicly slandering the Roxxon brand. (Wolverine: Weapon X#15 (fb)) - Unit L17 slew two people, completing Roxxon Executive Order #919. (Wolverine: Weapon X#14 (fb) - BTS) - At some point, the Peaceloks earned the nickname "Deathloks." (Wolverine: Weapon X#12 (fb) - BTS) - At some point, the General (a potential future incarnation of Unit L17) became leader of a group opposing Roxxon and its Deathloks/Peaceloks. 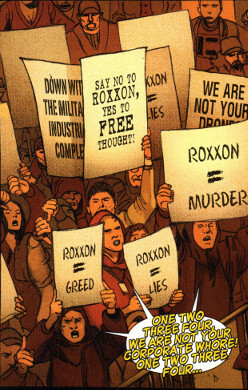 (Wolverine: Weapon X#13 (fb)) <22 years into the relative future> - Roxxon sent Deathloks to act as "crowd control" (to attack and drive off) protestors outside Roxxon's gates. Spider-Man (Peter Parker) attacked the Deathloks with a rifle weapon and then sent his "amazing friends" spider-bots to attack them as well. However, the Deathloks identified, defeated, and then slew Spider-Man. (Wolverine: Weapon X#12 (fb) - BTS) <25 years in the relative future> - Having developed or obtained a time machine, Roxxon prepared to send their Peaceloks into the past to kill the younger selves of those illegally powered insurgents who continued to plague them. (Wolverine: Weapon X#12 (fb) - BTS) - Miranda Bayer and her troops were too late to stop a group of Deathloks from killing the Punisher (apparently Frank Castle). 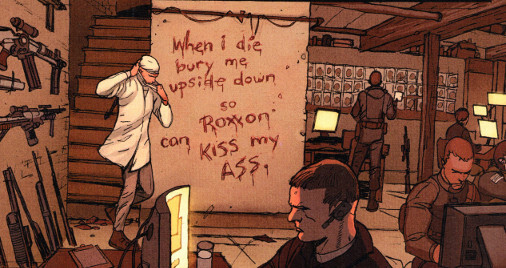 (Wolverine: Weapon X#12) - Learning of high energy readings at the north side of a Roxxon facility, Commander Miranda Bayer appreciated what Roxxon was trying to do, and she gathered her team to stop them. Secretly working with the General, Logan (formerly Wolverine, now lacking both of his hands) accompanied Bayer and her agents on the mission. Taking point, Wolverine enabled the other warriors to safely enter Roxxon's main facility. (Wolverine: Weapon X#13 - BTS) <In the relative past / modern era of Reality-616> - Dr. David Heimerdinger -- apparent creator of the Deathlok technology in Reality-11051 -- was slain by the time-traveling Deathlok Unit L17. (Wolverine: Weapon X#14 (fb)) - Unit L17 joined other Peaceloks in dousing Wolverine with acid, apparently killing him. (Wolverine: Weapon X#12) - Miranda Bayer then ordered her troops to ready their grenades and they charged forward to take out the time machine. (Wolverine: Weapon X#14 (fb)) - As they prepared to head back in time, Unit L17 joined the other Peaceloks in fighting the invading rebels Miranda Bayer, Wakowski, and their allies. 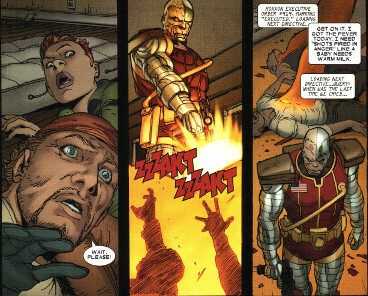 As Bayer made her way to the command center, Deathlok L17 confronted her, pleased to comply with the computer's order to neutralize her. (Wolverine: Weapon X#14) - After Reality-616's Evan Wakowski perished in the modern era, the relative future's Wakowski-10511 vanished, leaving Miranda Bayer's group overwhelmed. The General's aide advised him that the Deathloks were altering the past, and they could not tell what had been changed. As she urged him to get instructions to their agent (Miranda Bayer-616), the General authorized the brain of Emma Frost to send information back to Miranda-616 via the head of Kang. (Wolverine: Weapon X#15) - Bayer got the upper hand on Deathlok Unit L17, but she apparently recognized him as the Deathlok she had encountered in the past 25 or so years ago. Bayer then allowed Deathlok L17 to kill her so he could appreciate the nature of self-sacrifice. (Wolverine: Weapon X#15 (fb)) <Reality-10511> - The Deathloks then traveled the temporal portal, preparing to neutralize all superhumans that might be a threat to them in the future; glancing at Bayer one last time, Deathlok L17 passed through the portal into the past as well. The General assured his aide that this was necessary. In Wolverine & the X-Men#4, Deathlok notes himself to have been manufactured in 2030. Perhaps that is the date the Deathlok project was first initiated? It would seem some of the dates are in error...or that the alterations of Earth-616's history as opposed to Reality-10511's may have altered the timeline of Reality-10511 somewhat. I think the sociopath was shot about 20 years in the future, and the Deathloks/Peaceloks were assembled over the next year or two, with Spider-Man conflict being 22 years in the future, and the final battle with the Deathloks going back in time as 25 years in the future. 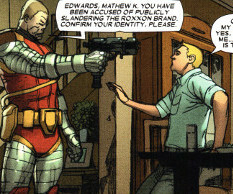 The actual dates are likely topical, as the young boy who would become the sociopath part of Deathlok Unit L17 looked to be 8 years old in the main story, which would be fine with him becoming Deathlok in 2030 from a story written in 2010, but now another 7 years would have passed as of 2017, and he would be a little young for the first flashback...and he would be relatively younger each year that passes in real time. In Wolverine: Weapon X#14, the adult sociopath that would merge with Deathlok said he was born in Dunwich Sanitorium. In #15, the 20 years younger Reality-616 counterpart was to be brought to Wayland, Massachusett's Danmar Sanitorum as a young boy. Was the human counterpart was born in Dunwich in Reality-10511 as a divergence from Reality-616 (there certainly were a few divergences) or perhaps he wasn't literally born there, but figuratively...that's where his sociopathic nature truly came to life? Miranda's surprise that the General was not coming with them on that mission indicates that she had worked with him before...which means she had seen him before...yet she apparently did not realize his true identity. He wore a hood only when we saw him, but perhaps he had some sort of illusion-casting device, or something? 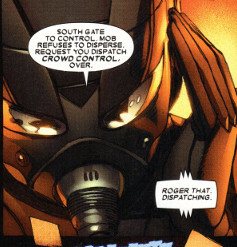 Her Reality-616-self further notes that the General kept his identity secret; the rebellion did not know who he was, they just know he was a super-powered operative who arose from the modern/heroic age. Look at the size of the mother's belly in the main image...what's she got in there? Dodecakids? On the outside, it appeared to be a bookstore that was going out of business. A quiet man sat behind the desk, which concealed an array of firearms, grenades, etc. He had a buzzer that either granted a person safe access or perhaps informed the others in the back that someone was coming. By pulling a specific book in a back bookshelf, apparently by Fyodor Dostoyevsky (perhaps "The Idiot"), one could get access to the secret back section. In the back room, members of the resistance opposing Roxxon gathered and made plans. (Wolverine: Weapon X#12) <25 years in the future of Reality-10511> - Posing as a physican, Miranda Bayer entered Howlett's book store, where she accessed a secret passageway into a resistance base in the back room. Revealing her failure the previous night, she added a "slain" label to the Punisher's picture. 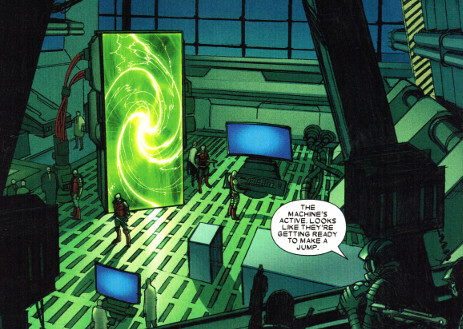 She then received information of energy readings at the north side of the Roxxon facility; noting that this was where Roxxon kept "the machine" (presumably referring to their time machine), she realized that Roxxon was getting ready to make a time jump. She instructed that her team be gathered, but they announced that they were already there and ready when she was. As she picked up a weapon, she added that someone should contact the General, but one of her men (Wakowski) told her that he already knew and wished her luck. She was surprised the General was not coming with them, but her agent told her the General said he could not go this time. Her agent then advised her that someone had volunteered to go in the General's place, and Miranda was surprised when Logan (the now handless former Wolverine) greeted her. 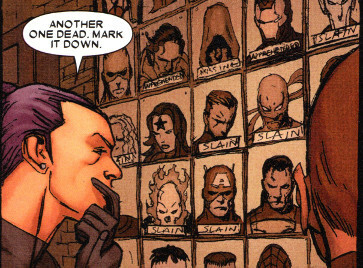 In the secret room in the back of Howlett's book store, the resistance kept track of the heroes they lost. the tops of two heads, either of which could be the Hulk, and Spider-Man (his status wasn't shown, but we know he was previously slain). An apparent husband and father of two, Mathew was acused (by Roxxon) of publicly slandering the Roxxon brand. (Wolverine: Weapon X#14 (fb)) - Peacelok Unit L17 was sent to eliminate Edwards. Kicking down Edwards door, L17 aimed his gun, stated the crime of which he had been accused, and asked him to confirm his identity. As soon as Edwards acknowledged his identity, L17 fired an apparently fatal shot into his forehead. Note: You might ASSume the spelling Mathew to a be a typo, and it may be, but just look at how people's names are beind spelled differently each year...I don't think it's a stretch to have this be a common spelling some 25 years in the future. This was presumably one of Peacelok Unit L17's early kills, as he noted that he took back everything bad he ever said about Roxxon and that he loved this job. The apparent wife, son, and daughter of Mathew K. Edwards. (Wolverine: Weapon X#14 (fb)) - When Peacelok L17 kicked down their door and confronted Mathew, the wife and kids hid by their dining room table. After killing Mathew, L17's sociopathic human self turned towards the family, preparing to finish them off as well and asking, "Who's next?" However, L17's computer overrode the sociopath, forcing him to accept that these people were not targets and that he had to proceed to his next target. (Wolverine: Weapon X#15 (fb) - BTS) - Martin and his unidentified female co-worker installed a series of brains into cybernetic mainframes that controlled the most advanced artificial intelligence program ever designed. (Wolverine: Weapon X#15 (fb)) <25 years into the relative future of Reality-10511> - The brain of an unidentified sociopath was apparently the first to be activated (and would later become Peacelok/Deathlok Unit L17). They were ecstatic, but when his co-worker suggested they tell the others, Martin suggested that they might first celebrate for a bit on their own. Though intrigued, she wondered if they shouldn't turn off the brain they had activated; however, when Martin reminded her that it was just a dead guy's brain and a bunch of wires, she encouraged him to move forward. The computer set a restore point, it's first recorded memory, as "the human reproductive act as viewed through formaldehyde." (Wolverine: Weapon X#15 (fb) - BTS) - The female scientist had an affair with particle physicist Abraham Bjornson. (Wolverine: Weapon X#15 (fb)) - When Martin was furious upon learning of this affair, but the female scientist chided him for acting so surprised, as she felt he couldn't really have thought their relationship was leading anywhere. After he asked how could she go so low as to sleep with a particle physicist, and she taunted him, telling him he acted like he never had a brief sexual fling with scientific colleague while experimenting on human brains before. Lamenting that he had been planning to introduce her to his mother, he got sick as she tried to remind him that the executives were going to be there any minute to view the Peacelok units and asked him to help finishing installing the last of the brains. Disgusted, she noted that men were all like fragile flowers when it came to dealing with their emotions, and she told the corpse upon which she was working that it was lucky that it would never have those problems. (Wolverine: Weapon X#15 (fb)) - The computer (presumably L17's) opened new folder 10572, saving the event under "complexities of human emotion" and tagging it for further study.